It's been fun seeing more flashes of color in the trees. Yesterday I saw that the goldfinches had regained their brilliant yellow feathers as they prepare for breeding season. They hang out around this area all winter, but turn a dull gray with just a touch of yellow. Now they're back to their magnificence. They're hanging out in mixed flocks with pine siskins, but before too long the pine siskins will be able to move up into the pines, where they'll make their nests. 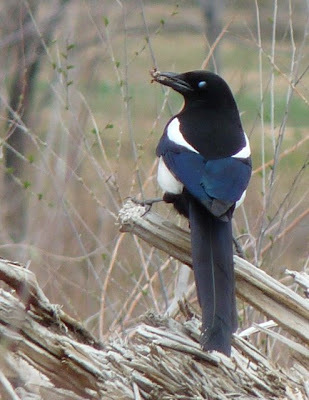 Black-billed magpies stay here year-round, but here's one with a bit of vegetation in its mouth, presumably for a nest. It can take them up to 40 days to make their large nests. 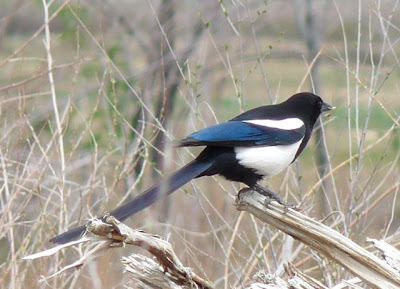 Magpies, with their long tail and strong contrasting black and white feathers, are an easily recognizable sign that you're not in Kansas anymore. Actually, they do live in Kansas--but they don't live east of the Mississippi. This member of the crow family only lives in western North America. 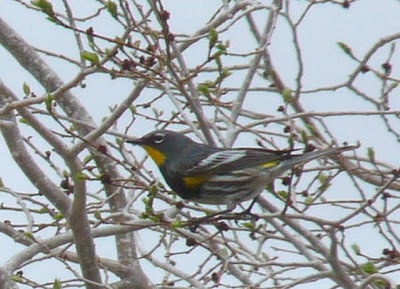 Less conspicuous in color but noisier are the yellow-rumped warblers. All of the warblers head south for the winter, and the yellow-rumped is one of the first to return, often before it is warm. 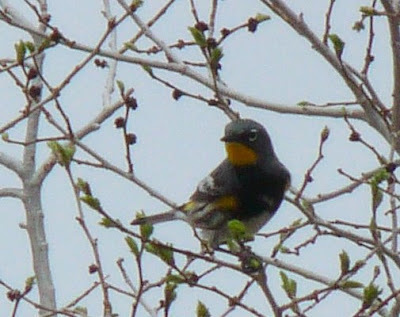 The little patches of yellow on its rump, under the wing, and under the chin make it fairly easy to identify. And along with the birds decorating the spring landscape, the snakes have left their dens. 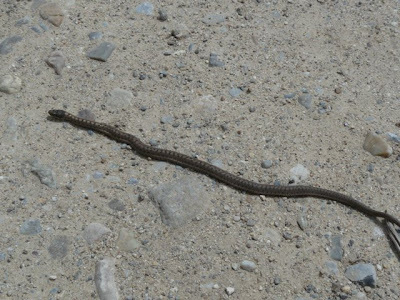 This is the common garter snake, the most widespread reptile in North America. They are harmless and eat everything from insects to small mammals to fish. In the West, they are often found near water. 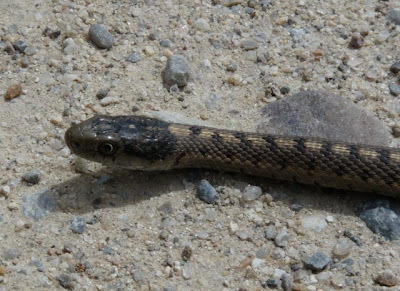 Garter snakes have fascinating life histories. Well, it's time to head back outside and see what else is going on! 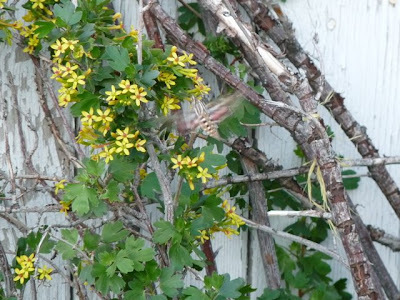 It's a bird, it's a plane, no...it's a giant pollinating moth that's hovering near the currant bush near our front door. 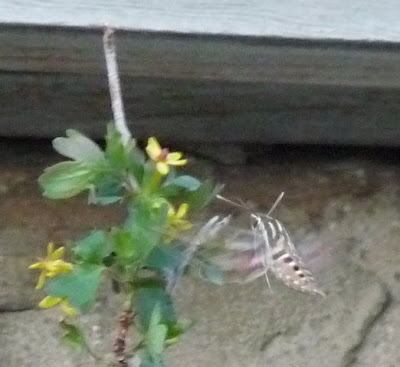 I went out one evening and was surprised by the numerous moths zipping from one flower to the next. 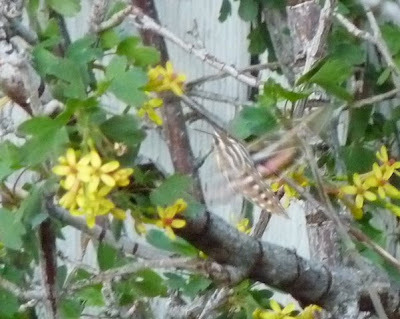 A little research on the internet showed me that this huge moth that is almost the size of a hummingbird is called, get this, a hummingbird moth! 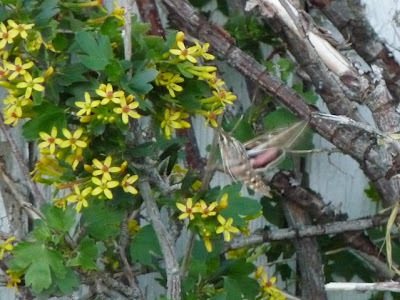 The family, sphinx or hawk moths, are nicknamed hummingbird moths because of their resemblance. This particular species is a white-lined sphinx moth (Hyles lineata). The species name lineata refers to the the white lines that stripe them. They also have a tan line down each wing. The moths were constantly moving, and their long proboscis (that's a fun word to use), was obviously well-adapted for the deep tubes of the flowers. 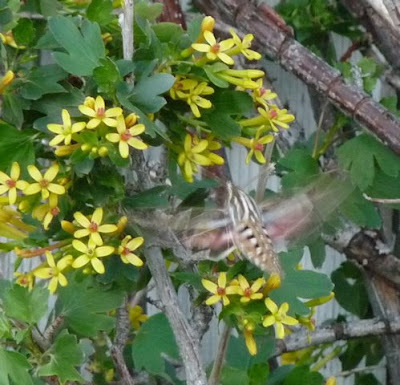 Several white-lined sphinx moths darted around the bush, moving from flower to flower. They didn't seem particularly disturbed by me or Henry. Apparently they often prefer white or light-colored flowers because they are easier to see during dusk and night, their most active period. Being moths, they have to go to a caterpillar stage, and they like to burrow into the ground. Wow! Caver caterpillars that morph into hummingbird-like moths. These are rad! Not only that, but they are found all over the U.S.
To learn more about white-lined sphinx moths, check out the great Butterflies and Moths website or see some awesome photos at this blog. 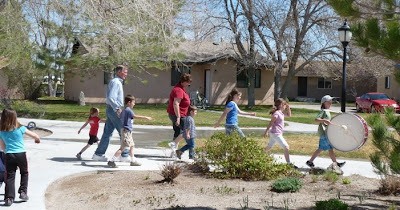 We went over to the pre-school last week and Desert Boy had the opportunity to play with other kids. 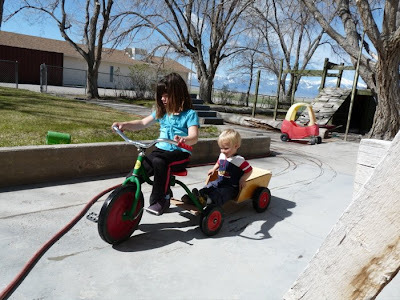 He found out it's a lot of fun to make friends with older kids who can take him on fun trips. Jenna was really patient with him, happy to have someone younger than her to do what she said. 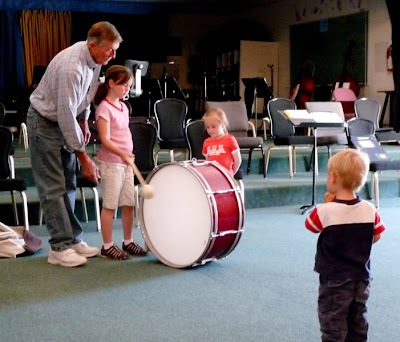 Later we went to the kids' music class, which involved trying to march in time to the beat of a bass drum. Most of the kids did really well. It brought back memories of marching band for me! Desert Boy had trouble staying with the group because he kept getting distracted by flowers and sprinklers and dirt. We never have a fast walk unless he's running somewhere where he isn't supposed to go. 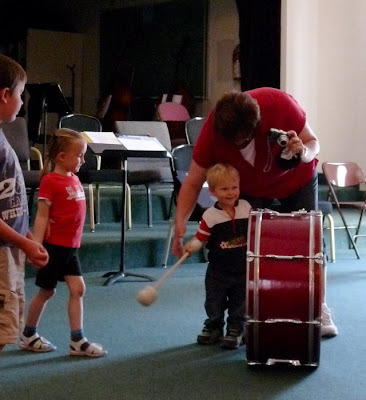 Back inside, kids took turns banging on the drum. Desert Boy paid close attention. 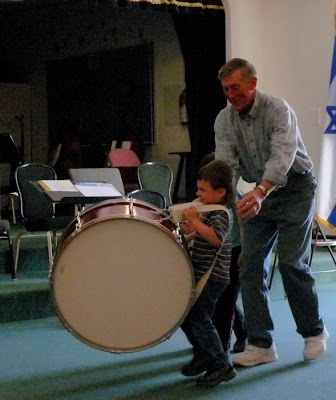 His older friend had to take a turn carrying the drum that was as big as him! And then finally it was Desert Boy's turn to bang on the drum. He didn't want to stop. 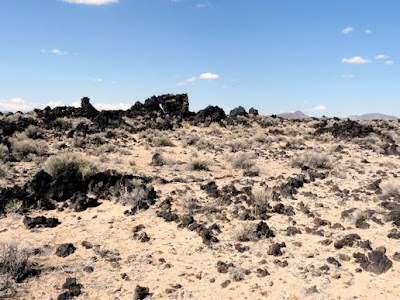 Out in the middle of the three-hour long drive between Ely and Tonopah, with no public bathrooms, no telephones, no gas, and no soda machines, part of US Highway 6 passes through the Lunar Crater Volcanic Field. 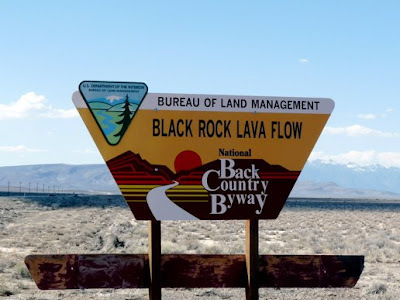 A BLM sign alerts drivers who are still awake about the nearby Black Rock Lava Flow. You can see it from the highway, but it's much more interesting to take the one-mile detour (the sign says two miles, but it's wrong), and get out and stretch your legs a bit. 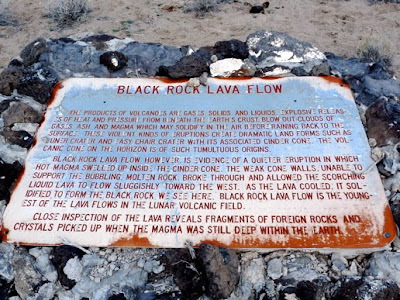 A sign gives some information about the lava flow with the unimaginative name. The lava flow is made of basalt. Hot lava swelled up inside the nearby cinder cone and broke through the walls, flowing towards the west. As the lava cooled, it solidified. 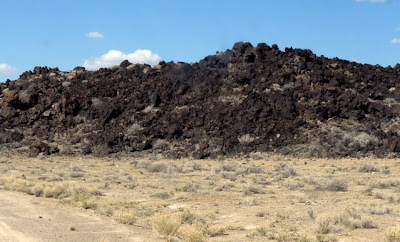 The Black Rock Lava Flow is the youngest of the lava flows in the lunar volcanic field, and covers about 1,900 acres. 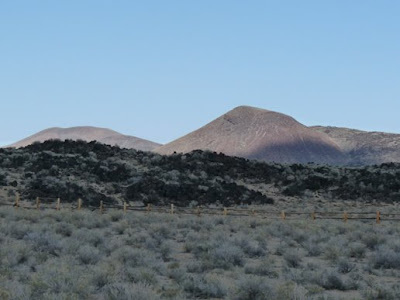 Behind the lava flow are a couple of the many cinder cones in the area. 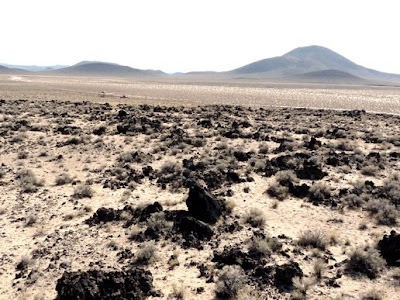 The entire Lunar Crater area in central Nevada encompasses about 100 square miles and includes more than 20 extinct volcanoes and 35 lava flows. You can read a bit more about the geology of the area on this USGS page. I was a little surprised when I walked up to the lava flow to see that not all of it was solid lava, like I've seen at other lava flows. The south edge of the lava flow has many scattered pieces of basalt. Among the basalt are bushes and dirt--and probably quite a few wildflowers right about now. I visited in March, when the temperatures were wonderful for exploring. 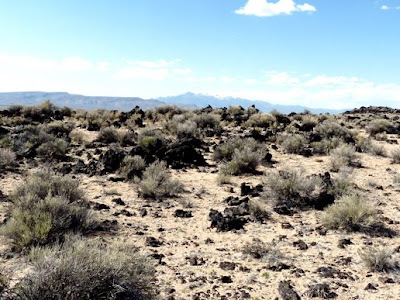 In the middle of the summer, this area can be scorching, with the black basalt absorbing the hot desert sun. In the winter, it can be covered in snow. 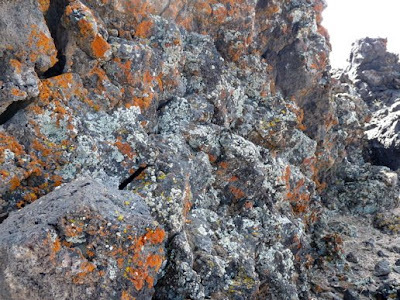 The basalt hosts an interesting array of lichens. 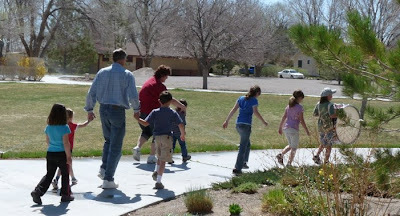 Here's an interesting post about lichens in the Salt Lake area. They certainly lend more color to what might be described as a rather stark view. 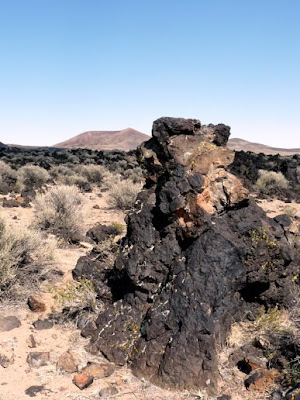 I should mention that the Black Rock Lava Flow is many hours away from the Black Rock Desert, where the (in)famous Burning Man Festival is held every year. 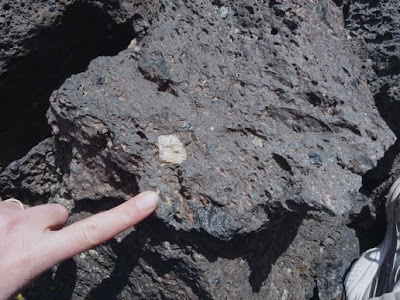 Embedded in some of the basalt are rocks and crystals that the magma picked up deep within the earth on its way to the surface. 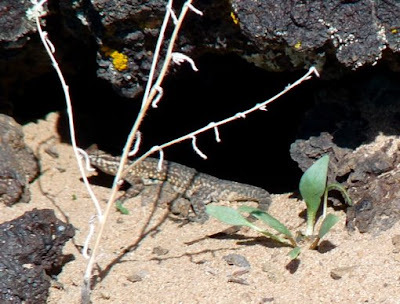 Lizards love to hang out in the lava field. As you can see, the lava flow really stands out from the surrounding scenery. 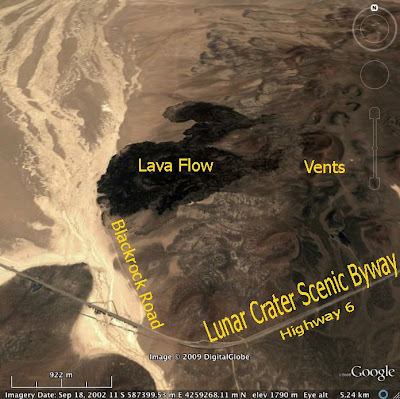 Not too far away is Lunar Crater, a maar about 4,000 feet across and 400 feet deep. I hope to get there soon! It's been a lot of fun listening to the different sounds in the air as migrating birds pass through the area on their way further north and breeding birds return to make their nests and get ready to fill them. 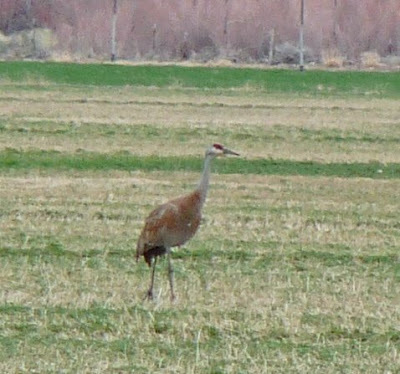 One of my favorite bird sounds is the sandhill crane, which sounds like sort of a rattling, gurgling goofball. I know, that's highly scientific. Maybe it would be better to call them pterodactyls like my husband does. If you want to hear the call, click here and go about half-way down the page. 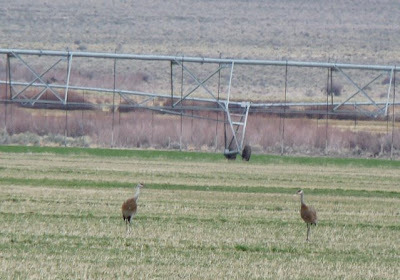 The sandhill cranes like to hang out in the fields eating grain and insects. 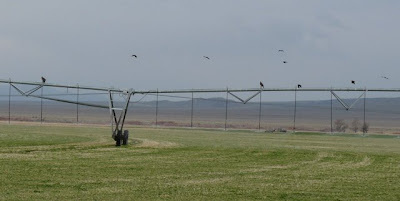 The pivots are big attractions for ravens and hawks. We call the hawks 'pivot hawks' no matter what species they are. The convenient high perch helps all the birds spot prey, like gophers. 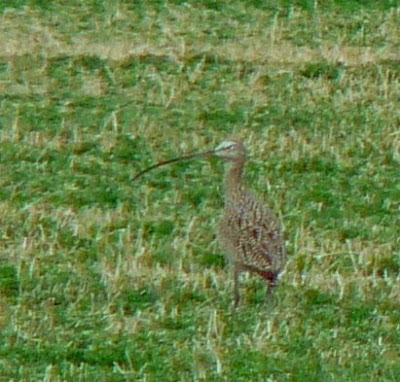 Another noisy bird that's back is the long-billed curlew. That long bill is slightly different between the males and females, and they use it to eat little invertebrates, including digging earthworms out of the fields. Here's a closer view of that cool-looking bill. It almost makes the bird look a little unbalanced. You can find out more "official" information here. 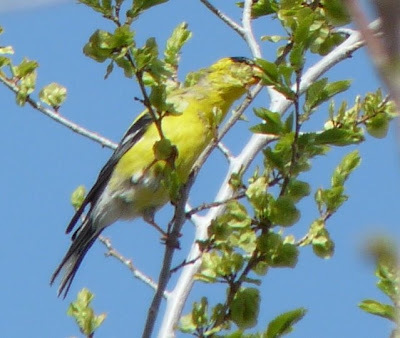 There are a lot of other birds that have come back lately, and with the trees putting on leaves, it's getting harder to spot some of them. Some of the birds are busy building nests, while others are more intent on finding food. It's definitely a busy time of the year, and it's fascinating to observe it. So turn off your computer and head outside for one of the greatest shows on earth! My husband needed to check some fields and asked if Desert Boy and I would like to come along. We jumped at the opportunity, both of us wanted to see something different. 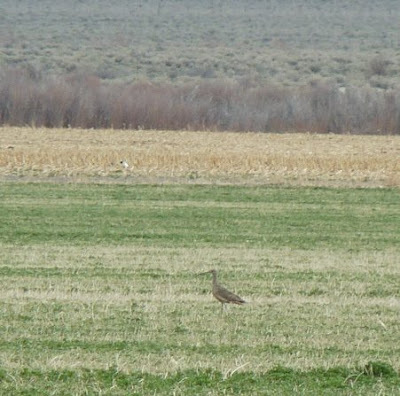 So after we got there, I started looking for birds and flowers while my husband took Desert Boy to go make sure the irrigation pivots were running correctly. I walked in their direction, and when I got closer, I saw a strange sight. I looked closer. 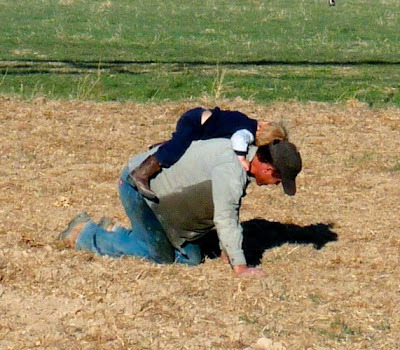 No, I wasn't imagining it, my husband was down on his hands and knees in the field and Desert Boy was playing cowboy. 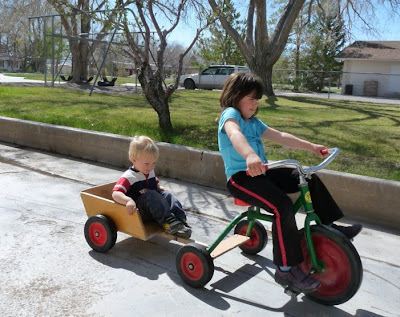 This looked like a lot of fun. 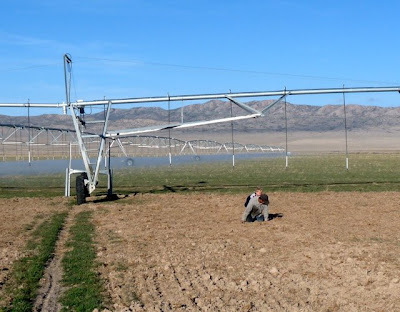 As I got closer, I saw my husband was all wet from adjusting the nozzles on the pivot. I also saw Desert Boy had a good grip on his collar. He's learning. 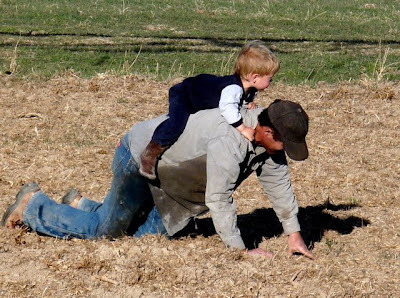 My husband actually had a purpose being down on his hands and knees. 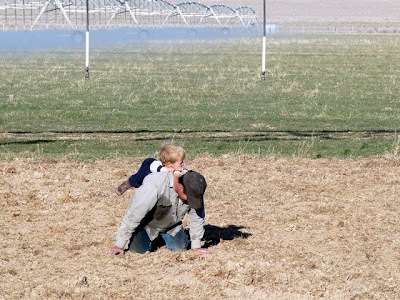 He was checking the field for sprouts and checking the soil moisture. Of course I wouldn't have known that if I hadn't asked. It must be tiring work hanging on. 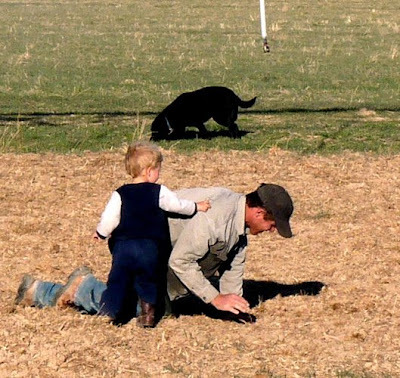 Finally it was time to get off, thank Daddy, and run off to play with Henry. Around this area, April is the month for sheep shearing. A temporary camp is set up in the same location for a week each year, sheep shearers come all the way from Australia and New Zealand (they are on a sheep shearing circuit in the U.S. for a few months), and thousands of sheep are gathered. They (the sheep, not the sheep shearers) have thick, wooly coats that have spent the last year growing. A specialized sheep shearing trailer is brought in, and the sheep are moved through it efficiently, with over 1,000 sheep sheared each day. Unfortunately I didn't manage to get any pictures of the actual shearing (I guess I'll have to keep this blog going another year to get the photos!). 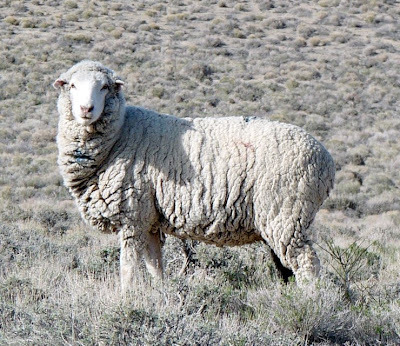 But I do have some photos of sheared sheep to show. After being sheared, the sheep are put into a pen. They look a little strange without their bulky wool. I wonder if they feel naked. 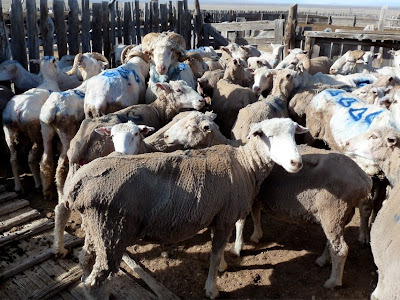 If you're wondering what the blue marks are on the sheep, it's paint. 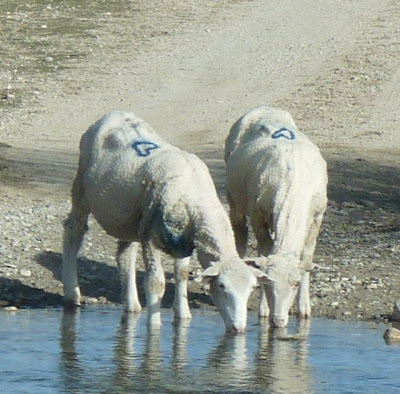 Instead of branding sheep, the sheep owners paint their brand onto the sheep. In this case, the "brand" is in the shape of a heart. This big ram was watching me take photos. By the curl of his horns, you can tell he's been around awhile. He looked calm in the pen. He's obviously been through this procedure quite a few times and has resigned himself to his once-a-year haircut. The wool is bundled into cubes and then loaded into a semi trailer. They were trying to push the cubes in a little more to get the last few loaded. This semi trailer is carrying wool from thousands and thousands of sheep. As the truck is getting packed up, the last sheep camps are being prepared to move to the next camp. 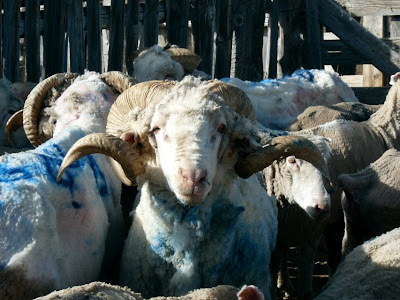 During the week, many of the people involved with the shearing stayed at the remote sheep corral, being serenaded at night by the baaing of sheep. After being processed, the sheep are herded back onto the range. These two pause for a drink. 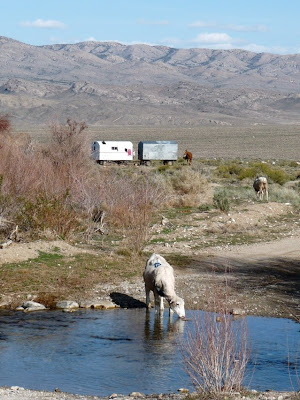 Although our ranch doesn't raise sheep anymore (the boys sold the sheep they hated taking care of one year when their dad was on an extended trip), sheep are still a very big part of the valley. 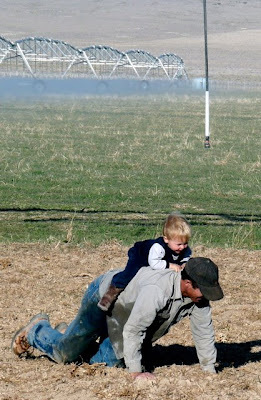 At one time there were strong feelings between cattlemen and sheepmen, but nowadays most everyone gets along. Both sheep and cattle graze specified allotments, and thus the two usually don't mix unless the owner has both and wants them to. Most of the sheep will be leaving our area soon, heading towards their summer range. But they'll be back next fall. If you can't wait that long, here are some other posts I've done about sheep. Some of the meadows near our house have become overgrown with rose bushes and willows, so lately Grandpa has been out trying to restore the meadows. 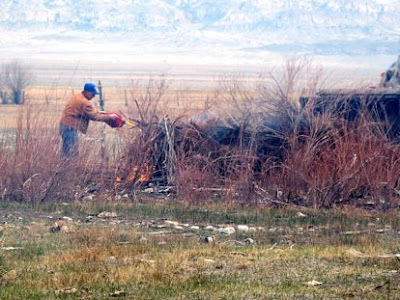 He's been using various tools, like a grader and a tractor pulling a scraper, but by far his favorite method is to burn the bushes. First he makes big piles with the giant loader. 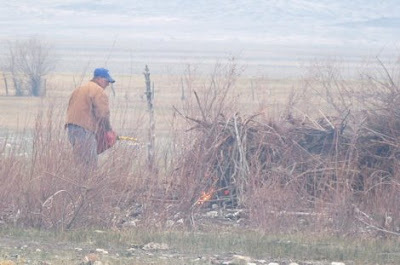 Then he gets out the gas can, spreads the gas liberally, and lights the pile on fire. Since we've had recent storms, the ground is fairly moist, so this is a good time to burn and not catch everything else on fire. Desert Boy and I maintain a safe distance to watch the lighting, and make sure we stand upwind. I've started running again, but I'm not all that fast, especially if I have to tuck an almost-two-year-old under my arm! Everything goes well, and Grandpa seems to be just as enthralled with the flames as we are. We didn't come prepared with our marshmallow sticks, though. The smell of the smoke makes me think of campfires. 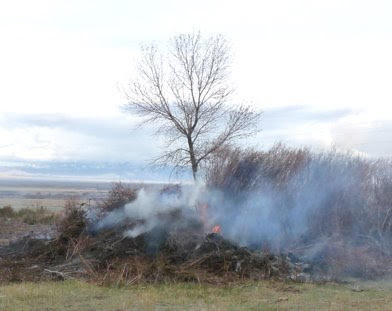 Some of the piles burn for a few days, leaving a lingering scent in the air. The smell makes me want to go camping and eat food cooked over the fire and look up at the night sky with the thousands of twinkling stars. 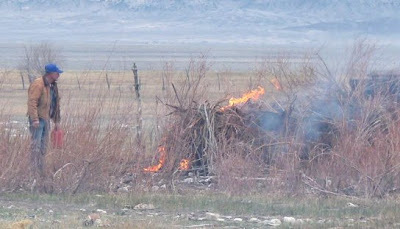 A good fire can do that, transport you to a totally different place.